Governments should be doing a lot more on climate change, but what are the major emissions in my home, and how could I decarbonise? The car. I recently bought a petrol car, because given how little I drive, I couldn’t justify the cost of hybrid or electric, and with brown coal power generation, electric cars arguably just move emissions from the tailpipe to elsewhere. Hopefully by the time this car is replaced, most electricity (certainly in my house) will be green and electric vehicles will be more affordable. So let’s leave the car aside just for the moment. In the house itself, several of the appliances involved are quite old and inefficient, and may need replacing anyway in coming years. So there’s an opportunity to move away from gas (unavoidably fossil fuel) to electricity (which can be renewable). Gas central heating — this system is more than 20 years old, and not very efficient by modern standards. Maintenance also seems to be increasing. Current thinking seems to be that split system air-conditioners are more efficient than has central heating, particularly from electricity from renewable sources. There’s a cost there of course — each area of the house would need a new unit fitted. I got one for the main living area a year ago for cooling, which is the other obvious benefit of installing them. Good insulation also helps. I’ve done the roof, and we have external blinds for summer, as well as ceiling fans, but wall insulation is worth doing too. 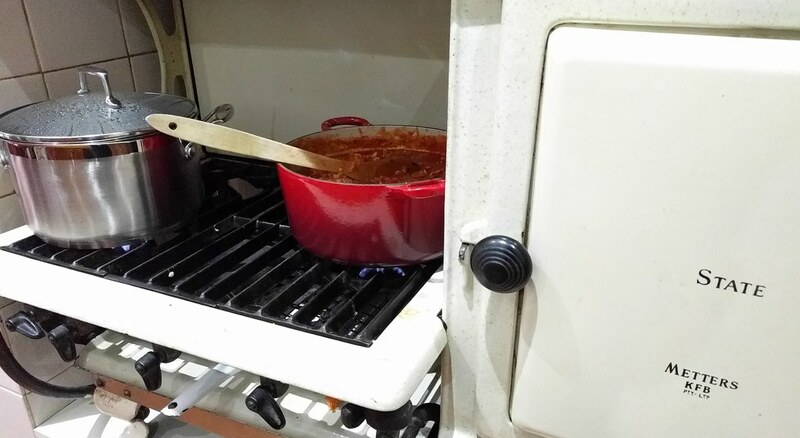 Gas cooking — my ancient gas cooker still works around 90 years after it was installed. It’s got minor problems though with gas leakage, and both the oven and cooktop are small and lack precision. We’ve learnt to live with this, but modern facilities would be nice – for instance an oven that’s big enough to cook multiple pizzas. Replacing these with electric could be the way to go. Electric cooktops can be induction or ceramic — I like the sound of induction, though that may require replacing some of my cookware. Gas water heater — ten years ago I got solar hot water with a gas booster. It’s worked well, though a bloke who came recently to clean the panel mentioned that parts are likely to need replacing before too long — perhaps in the next five years. Options might include a conventional electric hot water heater (expensive to run) or a heat pump, which can be expensive to install (up to about $3000), but are apparently quite cheap to run. Though come to think about it, I think I paid about $4000 for the solar hot water system. Electricity — currently I pay for green power, but an obvious upgrade would be to invest in PV panels, which have dropped in price markedly, and the new subsidies make it more affordable, even if the feedback tariff isn’t very high anymore. One benefit of removing the solar hot water would be making more space on my relatively small roof for more PV panels. 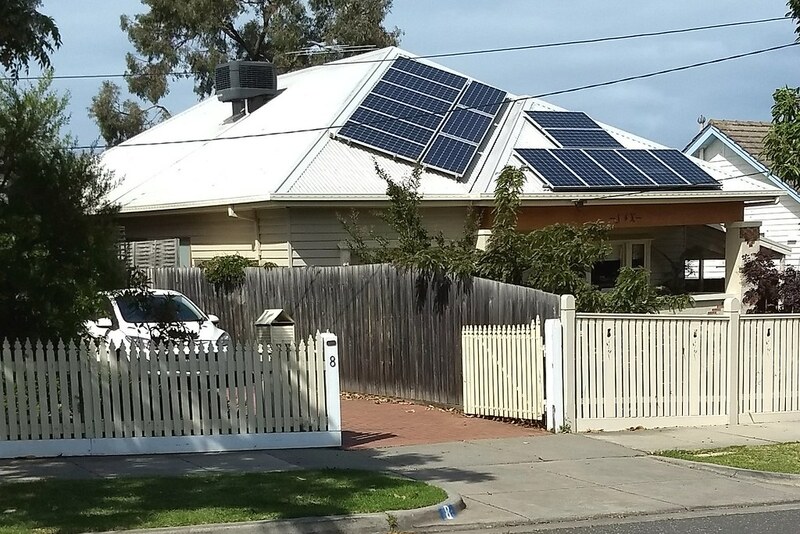 Some owners of houses with a small roof have been quite creative about maximising the number of panels – see photo above. There are also different options for PV panels, which some expensive ones generate more power — and of course one can install batteries to make use of the power generated rather than feeding it back into the grid (typically during the day) and having to buy it back at peak times (typically in the evenings). Batteries are really expensive though, well over $10,000 it seems. Can rooftop solar generate enough power at the hottest part of the day to run air-conditioning? I also need to keep in mind future development around me. My neighbours on the western side have rebuilt their house as two storeys, reducing sun onto the roof in the afternoon. If the same happened on the eastern side I wouldn’t be surprised — there’s been a lot of similar development in my street. Put all these things together, and (for a cost) I could move off gas completely, and move most of my power generation to solar, cutting my household emissions to hopefully near zero. I’m sure I’m not the only one pondering these issues. What are other people doing? Electric kettles use power. LOTS of power. I have an electric kettle. It’s pretty fast to boil water, but wow, does it burn up electricity. Here you can see our live electricity meter thingy on the fridge. On the left, a couple of lights are on, as well as the fridge and I think a computer was on as well. On the right — the kettle is boiling as well. Conclusion: Put just the water in the kettle that you need; don’t fill it up every time if you’re only making a cup of tea or two. It’s not just quicker, but it uses a lot less power. Update Wednesday 9:30pm: Some information from an Origin Energy insider (they are my power provider, and supplied the meter), in reply to the post and some of the comments. The comments on your blog are correct. Almost all electrical appliances should have a power consumption label in an inconspicuous place that will tell you the maximum power consumption. Kettles are normally around 2200W. It’s interesting to see how much energy heating and cooling systems use – even ducted gas heating and evaporative cooling which require powerful fans to propel air through the house. Your energy monitor will continue to work if you leave Origin BUT it may not show your energy costs accurately. It will stop showing costs completely after (I think) six months, because they didn’t want out of date energy costs being shown indefinitely. Your electricity consumption in kW will continue to be displayed indefinitely. If you do a factory reset though it will lose the connection with your smart meter and Origin will have no ability to reconnect it, as only the current electricity retailer can do this. However, if you are in the United Energy or Jemena distribution areas you can use their ‘Energy Easy’ portal to reconnect it (you should be in the UE area?) You would love the Energy Easy portal anyway as you can do all kinds of number crunching on your electricity consumption (but not see it in real time). The entire country converted to Compact Fluorescent Light-globes years ago, which is great, as they use much less energy and have a longer life. Well, if you use them properly. For instance I don’t use CFLs in the bathroom/toilet, as these lights are generally on for short periods of time, and CFLs are better when used for 15 minutes or longer. And the greenhouse gas reduction might be overstated – this Wikipedia article reckons it has resulted in a total nationwide GHG reduction of just 0.14%. The real problem is there seems to be no well-organised way to dispose of them safely. You’re not meant to just chuck them into landfill because they have a small amount of mercury inside them. Proper disposal locations are few and far between, and a lot of the information available on safe disposal relates to fluorescent tubes, not CFLs. Or it’s clearly at commercial disposals, not households. 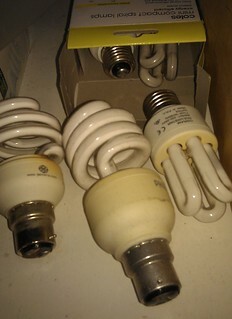 Some companies that sell CFLs are also involved in their disposal. I seem to recall both Ikea and Aldi advertising that they’d take them in the past, but I don’t recall actually seeing a collection bin in their stores. More recently, apparently Ikea has said they’ll only sell LEDs by 2016 — this would be even better than CFLs, as they last even longer, and don’t have any hazardous chemicals. So, how to get rid of them? I asked my local council what their position was on CFL disposals. Their reply included a number of web links, the best one being Sustainability Victoria’s A to Z of household chemical waste disposal. This lists a number of permanent and mobile collection points, the closest one to me being the Monash Waste Transfer and Recycling Station in Notting Hill. They will take CFLs for free, provided they are separated from any other stuff you’re dropping off (charges apply for most other types of waste). This is fine for me, I can stockpile dead CFLs and take them there once every year or two, but really it’s pretty poor for something now used in most households. How many people just chuck them into regular garbage because they don’t know? And how many people would find it impractical to get to a drop off point, for instance because they don’t have a car? A follow-up from the council said they’re investigating more collection points – not kerbside, but bins at places such as libraries and other council facilities. That could work quite well, but of course, part of the problem here is that there’s no nationwide, or even statewide approach. Witness hard rubbish – with some councils doing scheduled pickups and some doing booked pickups, the different methods across parts of Melbourne means that confusion reigns. In Glen Eira, if you book a collection and put your stuff out, half the time your neighbours will put stuff out as well, thinking an area-wide collection is coming. The other thing the council said is that apparently a scheme involving manufacturers/importers is being considered, but that sounds like it would require Federal legislation, so it could be years away. Until an easy, consistent method is provided for disposing of CFLs, you can bet most people won’t be getting rid of them properly. Or maybe it’s time we all moved to LEDs. Going solar – when should I jump, and how many panels? Pondering adding to the solar hot water on my roof with PV panels for electricity generation. My last electricity bill says I used up 659 kWh in 92 days, costing $187.61 (only including the cost for power and the 100% GreenPower surcharge; excluding the $76.41 service charge which I’d incur no matter how much power used)… that adds up to 2614 kWh in a year costing $744.32, or about 28.5 cents per kWh. Leaving aside feed-in tariffs, and assuming for a moment that every kWh generated I actually use (which wouldn’t be the case), theoretically the 1.5 system would save me $562 per year, taking about 4 years to pay off. The 2.07 system would pretty much save me the full cost of power every year, but take almost 6 years to pay off. The 2.76 system would give me an excess of about 1000 kWh of power each year. The feed-in tariff is only 8 cents per kWh these days, so I’d be saving $744 plus another $80 or so, so it’d take about 7 years to pay off. If I cave and get some kind of cooling system, then my energy consumption will of course go up. From what I understand, PV panels are dropping in price pretty fast. The longer I wait, the cheaper they’ll be (which is why I’m a little cynical about the ads you see on the telly implying if you don’t get in and order quickly, you’ll end up paying more). Meanwhile, electricity prices are expected to rise only moderately in the next few years. The bigger the system, once paid off, the greater potential in future years to make more money back from the feed-in tariff. But I also need to check how much space I actually have left on the north and northwest-facing sides of my roof, given the solar water panel already up there. And of course, once I jump in and switch to solar, I’ll be markedly reducing my personal emissions, which will be good! 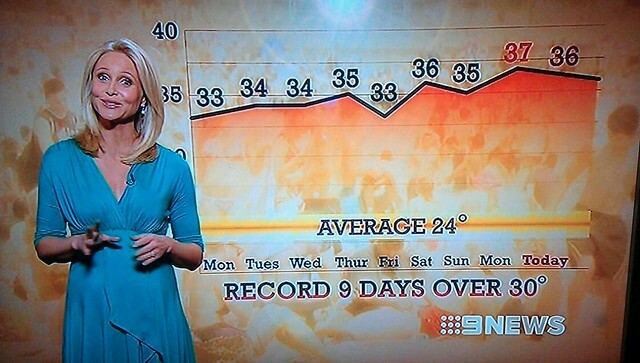 Thank goodness that scientists aren’t warning of any kind of permanent warming of the climate that might prove, y’know, dangerous — otherwise a record-breaking run of hot days might be a tad alarming. I don’t know if this record run of hot days is some freak weather event caused by something else, or a demonstration of how climate change manifests itself. But at the very least this record being broken should be a warning of what’s likely to keep happening into the future as temperatures rise.